With summer just around the corner, it seems fitting to explore more of the electric and eclectic ways that fine folks, just like yourselves, would like to, as they say – ‘party’ . You might think that because the Colonel just imbibed his fourth absinthe, or because Sir and Lady Astley once again decided to do a jig on the coffee table before breaking it and promptly passing out, that you’re having a ‘crazy old time’. The Enlightenment equivalent of karaoke after Thanksgiving dinner. Well, I loathe to burst your hedonistic bubble, but when it comes to having a good time, no-one beats the courageous, if not slightly insane ladies and gentlemen of the mid to late eighteenth century. ‘Mr Reamur … felt himself struck in his arms, shoulders and breast so that he lost his breath’. to which he points out ‘he was not inclined.’ I can’t for the life of me imagine why. It is said ‘he would not take another for the Kingdom of France.’ What a coward. So it was with many of the fashionable parties and bashes, soirées, salons and celebrations. While these days we’re content with a rousing drunken singalong of ‘For Goodness Sake Please Don’t Talk About The Prussians’, in those days, a good time equaled someone dusting off the electrical equipment with the intent to start zapping everyone in sight. In my previous article, we saw how the ‘Electric Kiss‘ caused brave young men to be rebuked for their ardor with a strong electric shock to the lips when attempting to plant one on a lady. 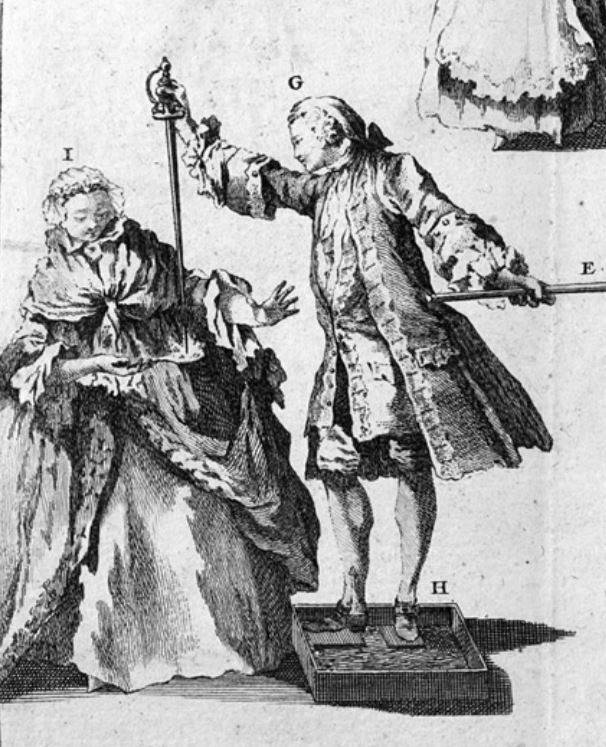 The ‘defeated’ male could hope to recover his pride with the use of the glaringly phallic ‘electric sword’ stunt where, when hooked up to an electric charge, he would wave his sword at a romantic prospect and strike them with a ‘shower of bright sparks’. It seems that wooing ladies in those days was an altogether different animal. Alternatively, the young male, eager to enhance his masculine allure, could alight himself upon an insulated stool and be charged with increasing amounts of electricity, such that in a darkened room a ‘luminous halo would appear above his head‘. This angelic treatment was known as ‘beatification’ and I would challenge any self-respecting lady to keep her hands to herself after observing that. The ‘electric fire’ would appear as a glowing light, accompanied by a static crackle and a faintly sulfuric smell, no doubt adding to his already irresistible eighteenth century musk. Additionally, if the man would be willing to part with a few drops of blood from a cut hand, audiences would witness the glowing and effervescent quality to the blood that dripped into a glass. An expression of true virility; again, I’m not sure how ladies of the time kept their bloomers on. What other types of games would you expect at such gatherings? Statically charged party patrons would toy with other materials, manipulating shreds of paper and also paper marionettes and puppets with their hands. Light displays of vivid sparks and whirls would dance and cavort in glass tubes, and bright shocks of static electricity would be thrown from conductor to conductor, or as shown below, from person to person. A priority for an attentive and considerate host was not to leave anyone out of the fun and games. Clearly taking advantage of the fact that their guests would apparently never shy from physical pain, the party would be asked to hold hands in a wide circle, with each end of the circle touching a charged Leyden Phial, resulting in ‘a shock to twenty persons, but did not doubt that it might be given to a thousand.’ Sounds like a challenge to me.